Prague Watchdog - Crisis in Chechnya - Ossetian-Ingush optimism - will it last? Ossetian-Ingush optimism - will it last? Late last year the heads of North Ossetia and Ingushetia signed a program to develop good-neighbourly relations between the two republics. The agreement is scheduled to run though 2010, and involves more than two dozen joint actions of an economic and cultural kind. Experts say, however, that the program’s main value lies in its inclusion of a range of measures aimed at returning the Ingush refugees who fled during the events of autumn 1992 to their original homes in North Ossetia’s Prigorodny district. Even if this latest agreement is successfully implemented, it will not be able to eliminate the main cause of ethnic conflict – the disputed status of Prigorodny district. For seventeen years the leadership in Vladikavkaz has followed the line that everything is up for discussion except the transfer of Prigorodny district to Ingushetian control. For their part, the Ingush authorities in Magas are keen that the debate should include anything that sooner or later may lead to a territorial adjustment in Ingushetia’s favour. The agreement that was signed on December 17 is tactically advantageous to both parties. Many Ingush politicians and public figures have long agreed that the large scale violence which broke out in Prigorodny district and Vladikavkaz in the autumn of 1992 made it impossible for Prigorodny district to be transferred without a formal redrawing of the borders. In 1990 or thereabouts a precedent was established on the edge of the disputed area in the ethnic Ingush border settlement of Maisky, which although technically inside North Ossetia obeyed not Vladikavkaz but Nazran. Doctors even came to Maisky from Ingushetia to tend patients there. Other villages in Prigorodny district were also settled by Ingush, often on terms that were illegal, in return for bribes. The settlement process gathered momentum, and in villages where Ingush became the majority population the power of Vladikavkaz was considerably weakened. The brief but intense armed conflict that erupted in the autumn of 1992 forced almost all the district’s Ingush residents to leave. For seventeen years they have sought to return. Of course, the Vladikavkaz officials take every opportunity to remind the world that of the more than 30,000 Ingush registered in October 1992, nearly 25,000 have returned to their homes. According to Vladikavkaz, the rest have nowhere to return to. The settlements on the city’s southern outskirts are officially located in a sanitary protection zone which supplies the entire city with water – and North Ossetian law states that people cannot settle in such an area. The reality, however, is much more complicated. Most of the so-called "Ingush returnees" can only visit their homes in safety during the daytime. Many Ingush homes have been burned down, and those that remain have been taken over by Ossetian refugees from Georgia. These people have also lost everything, and they have nowhere else to go. Several years ago, the then presidential envoy to the Southern Federal District. Dmitry Kozak, proposed that the heads of the two republics should draw up a new project to settle Ingush on the northern edge of the area between the village of Chermen and the town of Beslan. Funds were allocated, new houses were built and essential communications brought in, but eventually the project collapsed because the Ingush were unwilling to till the fields, which were unsuitable for cultivation. Meanwhile their former homes stood empty or ruined only a few kilometres away, with all the communication facilities and social infrastructure of the village. 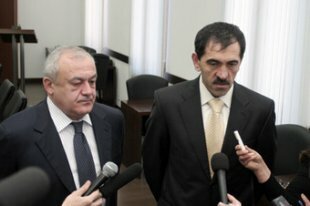 Although the December agreement between Taimuraz Mamsurov and Yunus-Bek Yevkurov precludes the creation of new Ingush settlements in Prigorodny district, it gives no clear answer to the question of where the Ossetian refugees from Georgia are to be resettled and of what is to become of the so-called “closed residence zones” in which both Ingush and Ossetians have lived for ages. In fact, the agreement is unable to resolve many of the problems. In North Ossetia the 1992 consensus on “the impossibility of Ossetians and Ingush living together on the same territory” is no longer valid. This formulation was used in several decisions of the North Ossetian parliament and brought harsh criticism from Moscow and a number of international organizations directed against the then parliamentary Speaker, Akhsarbek Galazov. The authorities that replaced Galazov did not use this thesis and they officially repudiated it, but in practice the local village administrations in Prigorodny district continue to be guided by it. Today the Ingush people residents of Prigorodny district and Vladikavkaz (the township of Karts) live in compact communities, feeling like strangers in the land. The terrorist attack in Beslan only complicated their lives. In the immediate aftermath of the attack, almost all of the Ingush were forced to leave Ossetia – and the anger of the local population has not yet subsided. Many experts have called the Mamsurov-Yevkurov agreement a breakthrough, and are optimistic about it. It is hard to say whether this reflects a rosy view of the situation that is divorced from reality, or a pragmatic realism. The events of August 2008 significantly increased the value to Moscow of both North and South Ossetia. The Kremlin has no reason to make the lives of the heads of those republics more complicated with the Ingush factor. Moreover, in 2010 the economic situation in North Ossetia (which will remain a base for the South Ossetian and Russian military stationed in South Ossetia) may seriously deteriorate. Last year the Istok alcohol enterprise, the largest in the south of Russia, went bankrupt – its taxes had accounted for 40 percent of the republic’s budget. Environmental activists in Vladikavkaz (according to some observers, not without assistance from opposition politicians) are currently seeking the closure of another large company, the Electrozinc metallurgical plant. If that happens, North Ossetia will be an almost entirely state- subsidized region, and this cannot but have an effect on the socio-economic situation of its inhabitants. All the signs are that Moscow will not try to aggravate the internal situation in the republic by encouraging the return of the Ingush refugees, and will likely turn a blind eye to the fact that the process has once again failed. It is possible that in order to reduce the tensions in Ingush society Moscow will give the refugees some monetary compensation, as it has done repeatedly since 1992. In Russia such compensation is usually accompanied by so-called “cash kickbacks", which are advantageous to the officials in Moscow and Magas. In short, it is time to remember that after the autumn of 1992 numerous agreements were signed between the presidents of the two republics: Akhsarbek Galazov and Ruslan Aushev, Alexander Dzasokhov and Ruslan Aushev, and later Murat Zyazikov. Not one of those agreements has been implemented in full, making one sceptical that that the present one will be carried through. The politicians and experts who today cannot explain why they see this agreement as a breakthrough are unlikely to be able to give a convincing answer when 2010 is at an end, and the agreement has still not been implemented.